The Best Asian Food blogs from thousands of top Asian Food blogs in our index using search and social metrics. Data will be refreshed once a week. Also check out Top Asian Food Youtube Channels list for Top videos on Asian Food. United States About Blog Asian at Home is a cooking show that hosted & directed by myself, Seonkyoung Longest. You can find any Asian dishes you can think of in my cooking show and if you can't see what you are looking for, just ask. Facebook fans 870,723. Twitter followers 3,566. Singapore About Blog The Asian Food Channel (AFC) is the premier and leading food and lifestyle broadcaster based in the heart of Asia. As the first food TV channel to broadcast pan-regionally in Asia, AFC provides a healthy mix of both Eastern and Western content in a variety of formats all day! Facebook fans 3,337,133. Twitter followers 14,050. United Arab Emirates About Blog Welcome to the Manal Alalem Channel! You will find here the best recipes of Arabic and middle eastern food also international recipes with an Arabic touch. Facebook fans 3,340,435. Twitter followers 462,951. Facebook fans 2,187,395. Twitter followers 2,842. Facebook fans 748,223. Twitter followers 63,943. Facebook fans 643,439. Twitter followers 19,054. China About Blog My name is Trevor James and so far, I've eaten and filmed street food and local cuisine in China, Malaysia, Singapore, and Thailand. Eating the same food as local Chinese, Malaysian, or Thai people has showed me that it's best to travel almost solely for the food! Food is something that connects us all, and to me, food is the best way to connect and have a true cultural experience everywhere. Facebook fans 963,881. Twitter followers n/a. Coimbatore About Blog A website with many south indian and north indian recipes, baking recipes and few international recipes....all recipes include stepwise pictures which makes it easy even for beginners to cook. Facebook fans 319,471. Twitter followers 2,098. Malaysia About Blog iCookAsia is a channel focusing on recipes mainly from Malaysia and across Asia. Learn or get aspired by watching more than 2,000 short step by step videos of unique Asian recipes. Facebook fans 262,465. Twitter followers 1,872. Facebook fans 272,255. Twitter followers 6,988. Huntsville, Alabama About Blog Christy Jordan's beloved recipes from her deep south heritage along with family favorite dishes that are easy on your budget! Facebook fans 218,123. Twitter followers 14,117. Facebook fans 176,516. Twitter followers 41. Facebook fans 151,196. Twitter followers 19,266. San Francisco, CA About Blog RecCome stop by for all things related to Asian food. Facebook fans 1,101,259. Twitter followers 482,313. About Blog A Chinese Food Blog by a family of Travelers, Cooks, and Adventurers. Living between Beijing and the US. Facebook fans 14,161. Twitter followers 1,775. Facebook fans 25,733. Twitter followers 2,707. China About Blog A blog about Real Chinese recipes and Chinese eating culture provided with detailed step by step Chinese recipes. Facebook fans 45,407. Twitter followers 199. San Diego, CA About Blog Japanese Cooking 101 is all about Easy and Delicious Japanese Recipes & Cooking Videos. Our goal is to show how simple it is to make Japanese meals at home. We create and test our recipes to be as easy as possible, yet as tasty and authentic as what we eat at home. Facebook fans 27,397. Twitter followers 823. Austin, TX About Blog Maggie Zhu write about modern chinese cooking - including street food, family recipes, and restaurant dishes. She takes a less labor-intensive approach while maintaining the taste and look of the dish. She is originally from Beijing, and now cook from her Austin, Texas kitchen. Facebook fans 22,546. Twitter followers 1,611. Singapore About Blog MissTamChiak.com brings a true sense of the delicious cuisine and incredible local culture of Singapore and all around the world. Facebook fans 84,030. Twitter followers 15,959. Facebook fans 23,010. Twitter followers 1,607. Facebook fans 230,589. Twitter followers 82. Singapore About Blog FoodNavigator-Asia.com is a daily news on sweeteners, flavours and vitamins. Free access to news on food science in Asia. Facebook fans 1,148. Twitter followers 2,078. Facebook fans 21,314. Twitter followers 1,236. Singapore About Blog An amateur Singapore food blogger who wishes to share with readers food experience they can find near MRT stations. Facebook fans 6,248. Twitter followers 1,989. Facebook fans 23,389. Twitter followers 44,394. US About Blog Welcome to Spice the Plate – a food blog about modern and traditional Asian cooking at home ! Facebook fans 1,564. Twitter followers 19. Malaysia About Blog Malaysian Flavours is a Malaysia Food and Travel blog by couple blogger Summerkid & Summergirl. Facebook fans 9,913. Twitter followers 23. Facebook fans 161,698. Twitter followers 233. 37. I Heart Umami - Recipes | Everyday Asian-Inspired Paleo Cuisine. Brooklyn, NY About Blog I'm Chih-Yu and I make everyday Asian-inspired Paleo cuisine at IHeartUmami.com ! I share simple, super flavorful with no added sugar recipes to make eating Paleo fit into your life realistically. Find more mouthwatering recipes on my blog I Heart Umami. Facebook fans 4,400. Twitter followers 206. About Blog Experience Asian recipes and travel from Vietnam, Thailand, Cambodia, Laos and Burma. Facebook fans 4,092. Twitter followers n/a. Singapore About Blog My name is Joyce, author of Eat What Tonight. Spending time in the kitchen has been one of my greatest therapeutic passion thus far even though I couldn't do it on a more often basis than I wish I could. Facebook fans 5,890. Twitter followers 8. Malaysia About Blog Malaysian foodie founded by Pamela emphasis on food, hotel, travel, shopping, product review and event. Reviews of restaurants, hawker and street food in KL, Penang and beyond. Facebook fans 21,720. Twitter followers 116. Bangalore About Blog An ex-IT person turned into a food blogger, consultant, home baker and a amatuer food photographer. Sin-A-Mon Tales by Monika is a canvas for her food memories, this is where she shares reviews, recipes and food stories from her travels and childhood. Facebook fans 8,287. Twitter followers 10,897. Hong Kong About Blog A Hong Kong recipe & food blog about the art of traditional authentic Chinese cooking & eating good food and all the cookery-wookery that goes with that. About Blog Bok a Malaysian Food Blogger & Travel covers various restaurants and eateries around the country, and also many across international waters too. Facebook fans 2,038. Twitter followers 820. NJ USA About Blog Asian cooking, culture and stories of recipes. Facebook fans 4,024. Twitter followers 3,226. Minnesota, USA About Blog Linda and Paul inviting you to discover the world of Malaysian Chinese cuisine. Their motive is promoting awareness and appreciation of Malaysian Chinese food, culture, and stories with detailed recipe instructions and video tutorials. Facebook fans 22,091. Twitter followers 12. Bahrain About Blog Hi! I'm Nada. I create simple, healthy, plant-based recipes inspired by Middle Eastern flavours and write about leading a vegan lifestyle in the Arab world. Facebook fans 5,088. Twitter followers 1,256. Karachi About Blog Find the perfect recipe for your next meal or gathering. Pakistani and Indian food recipes by Ainy organized for you in many different categories. Scottsdale, AZ About Blog Asian restaurant franchise serving a mix of Asian fusion Chinese food and American comfort food in a fun, upbeat environment. Facebook fans 10,773. Twitter followers 4,377. About Blog We search for good Penang food and we making sure you hungry after reading our post, Taste…iest is a must read for Penang food enthusiasts. Facebook fans 16,318. Twitter followers n/a. Penang, Malaysia About Blog Penang Food Blog featuring Hawker Food, Wine Events, Hotel Buffets & Restaurant Reviews, with Travel Stories by a food writer, food columnists and editor, CK Lam. Facebook fans 2,362. Twitter followers 336. Ortigas, Pasig About Blog A Philippine based blog with different local and international restaurant features, travel spots and food finds with a bit of tech products. Facebook fans 5,681. Twitter followers 3,906. Dallas, Texas About Blog Asian Mint ® Restaurant blends New Bangkok Thai Cuisine with a fresh Asian Fusion menu for exquisite flavors. Located in Dallas, TX. Facebook fans 8,040. Twitter followers 3,727. Cincinnati, OH About Blog Asian Food Fest (AFF) was created in 2010 by a diverse group of friends who wanted to spread their love of Asian food and culture through the city of Cincinnati. This vibrant community festival celebrates culture and cuisine from Asian countries. Facebook fans 3,584. Twitter followers 894. Amman, Jordan About Blog Looking for Lebanese recipes? Here you'll find more than 450 trusted, authentic, and home-style Lebanese recipes from savory to sweet. Facebook fans 15,862. Twitter followers 270. Facebook fans 2,571. Twitter followers 1,252. Facebook fans 23,108. Twitter followers 971. 63. Pisang Susu - Classic Indonesian recipes. The Netherlands Haarlem About Blog Authentic, classic Indonesian recipes. Easy, healthy and delicious. Facebook fans 8,521. Twitter followers 109. Tokyo About Blog Easy, Tasty, Fun, Creative and Kawaii Japanese Food Recipes and Cooking Hacks Blog with How-To YouTube Cooking Show Video Tutorials by ochikeron. Facebook fans 173,403. Twitter followers 9,438. Sydney, Australia About Blog Healthy Gluten Free Asian Recipes include Chinese, Malaysian, Singaporean, Thai, Japanese and Asian Desserts. Facebook fans 1,477. Twitter followers 1,865. About Blog Looking for Arabic food recipes and ideas. Explore the taste of Arab cuisine including cooking tips at arabic-food.blogspot.com. Facebook fans 23,939. Twitter followers n/a. Penang, Malaysia About Blog If you are looking to get some feedback and review on local eateries in Penang, Kedah & Perlis, then this is the site meant for you. About Blog Unique organic fruit combinations of jam, hand crafted in small batches with pride and love! Facebook fans 1,497. Twitter followers 244. Los Angeles About Blog The mission of EatinAsian is to heighten the awareness of EVERYTHING ASIAN and introduce everyone to a culture that is often misunderstood. Facebook fans 9,481. Twitter followers 6,671. Facebook fans 75,321. Twitter followers 913. Facebook fans 8,013. Twitter followers 1. California About Blog I am Kiki, the author here in this space. I started this blog to be able to recreate those tasty home meals that grandma used to cook for us and to pass on these recipes here so that it can be a blessing to my children's children and for you dear readers. Facebook fans 177. Twitter followers n/a. Facebook fans 2,364. Twitter followers n/a. Facebook fans 11,654. Twitter followers 98. United States About Blog Welcome to RunAwayRice! I am Trang. I am a recipe developer, home cook, food stylist and blogger with a passion for healthy eating and simple cooking. I take traditional Asian recipes and give them a modern twist. Facebook fans 4,844. Twitter followers 102. About Blog I love cooking all kind of foods but my best is Cambodian food because this was the food my grandmother and mother shared to me. Facebook fans 20,399. Twitter followers n/a. Malaysia About Blog Enjoy step-by-step recipes that are made easy to follow! Savour traditional Asian delights like Kueh Pai Tee and Popiah, to Asian-inspired modern day delicacies like Matcha Pancakes and Steamed Chinese Pumpkin Muffins by Angie Liew. Facebook fans 4,399. Twitter followers 26. Canada About Blog Follow Cooking With Momma Heng for traditional Cambodian cooking videos. Sydney, Australia About Blog Welcome to my Live Asian Kitchen! I run Live weekday broadcasts covering Asian, and more specifically, Southeast Asian cooking. Facebook fans 28,865. Twitter followers 5,721. About Blog The official account of Food Network Asia. The ultimate food destination. Loads of recipes and videos to satisfy your every craving. Facebook fans 324,961. Twitter followers 3,944. About Blog Nothing is better than going Home to Family and eating good food and relaxing. Queensland About Blog “Fresh” Natural Asian, a Noosa restaurant offering a unique experience of fresh true culinary of original Asian cuisines with an emphasis on healthy eating. About Blog A blog featuring Asian cuisine, recipes and more by Chef Pardus. About Blog I am a home maker living in Oman,Mother of a cute little angel,She is everything to me.Now my entire day revolves around her.I love my family and my home.Being inspired by many bloggers and youtubers and just to get confidence on myself.I started blogging. About Blog Jean’s Asian Cooking specializes in Thai, Vietnamese, Malaysian, Cambodian and Chinese Cooking. Our classes are designed to encourage hand-on participation and practice in a small group. 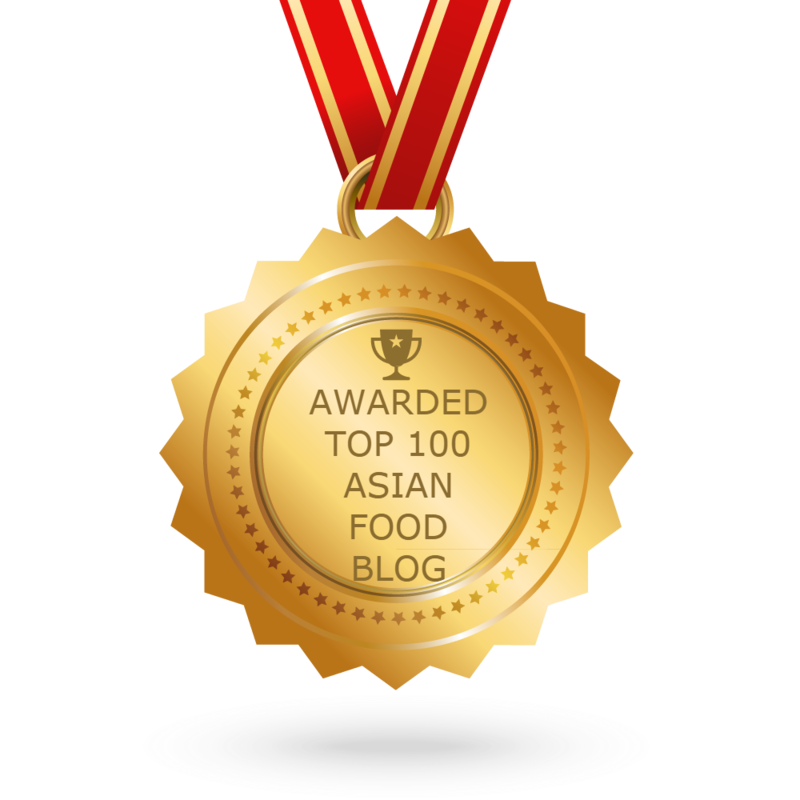 CONGRATULATIONS to every blogger that has made this Top Asian Food Blogs list! This is the most comprehensive list of best Asian Food blogs on the internet and I’m honoured to have you as part of this! I personally give you a high-five and want to thank you for your contribution to this world.